Good quality First World War apps are few and far between at the moment, and in fact could probably be counted on one hand. Thankfully Spot On Locations’ Great War adds to this tally. 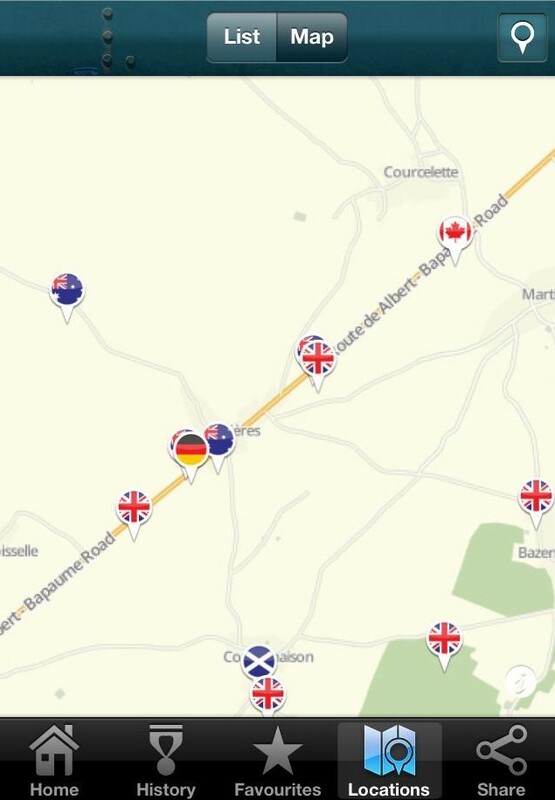 The premise of the app is simple; an interactive map of the western front highlighting 170 points of interest from Ypres down to the Somme. These are marked with a pin which can be set to represent either the country of interest or the category; cemetery, trench system, memorial, battlefield, historical interest, and museum. Handily all functionality (apart from directions via Google maps) can be accessed without being connected to the internet – useful for looking something up whilst avoiding costly roaming charges. Planned updates include new locations and the ability to import coordinates directly into the tomtom app. Full screen functionality for the ipad will also hopefully follow. 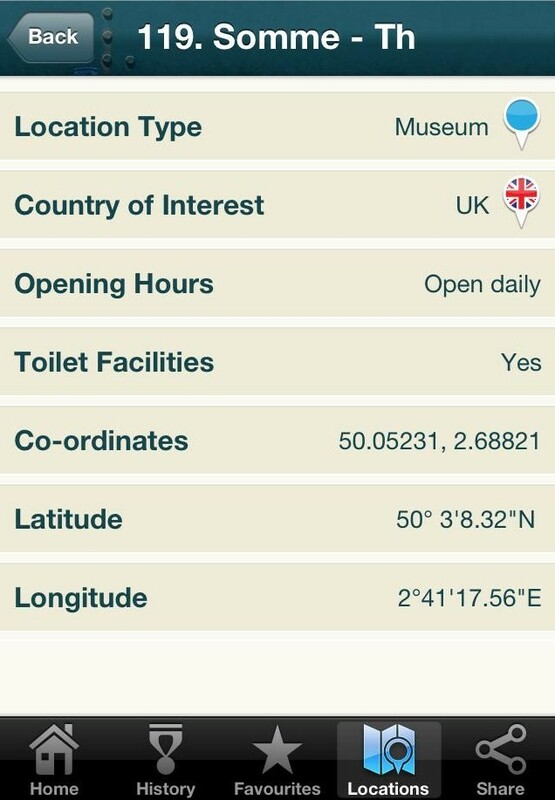 The app is visually appealing and simple to navigate, and priced at £2.99 it won’t break the bank. 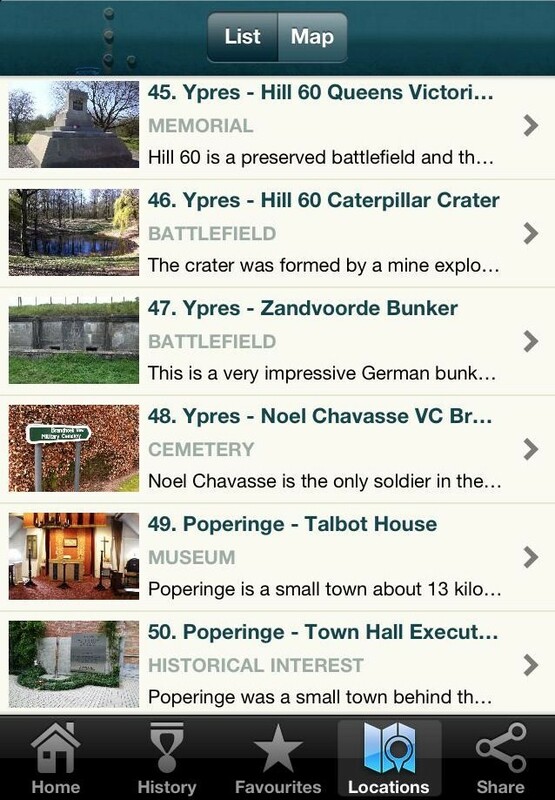 I can see how the app can be a handy reference tool when out on the battlefields, and whilst it won’t replace a detailed guide book at present, it has the potential for further development. As an aid for navigating to those hard-to-find memorials and cemeteries, Battlefields of the Western Front’ really comes into its own, and I look forward to testing it out ‘on the ground’ on my next trip to the western front.